Today is my first day home, after an enchanting and beautiful 10 day journey throughout Scotland. I am very grateful for the time spent there and for the many memories I brought home. I am also grateful that I arrived home early this morning and had today to recover from jet lag! I look forward to seeing all my family and friends, and getting back into the flow of business. However, today was a wonderful day of gentle self care, resting and sharing a few stories with several family members. Mindy and I enjoyed our daily afternoon tea so much, while we were in Scotland, that I was very intentional about continuing that tradition. For my first today, I enjoyed afternoon tea, in my garden. I bought and brought home several boxes of Scottish Tea. I have a white ceramic teapot and cups and saucers. I needed simple foods to complete my afternoon tea. Being a day of rest and self care, I didn’t tackle baking scones….that will be a first for the near future! I am grateful for Lorna Doone shortbread cookies and readymade chicken salad. I selected the Highland Blend Tea for this first lovely experience. Made by Edinburgh Tea & Coffee Company, it is a brisk and refreshing blend of fine black teas. It was golden in color and had a light delicate smooth flavor. I’ve adopted the British and Scottish custom of adding a dollop of milk to my tea. 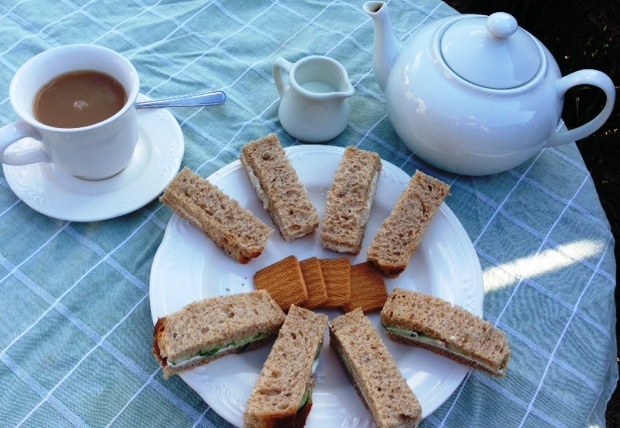 While tea bags were steeping in the tea pot, I prepared two varieties of finger sandwiches, chicken salad and thinly sliced cucumber and cream cheese. I added several shortbread cookies and tea was served! While my simple afternoon tea didn’t compare with the lovely high teas I experienced in Scotland, it was a start and more importantly, an honoring of my desire to continue the tradition of daily tea. That sip of hot tea, even on a 90+ degree summer day, brought a deep sigh of contentment and a smile. I am excited in the next few days and weeks to experiment with baking scones and other goodies and trying different types of finger foods. My second first for today, also related to the Scotland trip, was to download a CD onto my iPhone of the Scottish group, Red Hot Chilli Pipers. This fun, energetic group describes their music as “bagpipes with attitude and drums with a Scottish accent”. We heard their music and saw videos of them in various places in Scotland. I would have loved to have seen a live performance. Someday! Their music is an upbeat and lively bagpipes meets rock n roll. This is a great addition to my bagpipe music collection. It was wonderful to travel and see a long time dream become reality. And, it is wonderful to be home and back into my usual flow. Life is amazing!